From 1988 to 1989, I participated in a prison ministry team that would minister the gospel to the Youth Detention Center in Newark. A number of youth in their mid-twenties would go to do ministry. Most of the young women, however, stopped going when Mel, the handsome youth minister, left the team. When they left so did many young men. So only few of us were left. 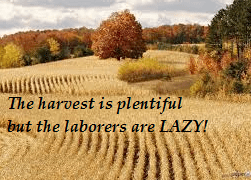 In this modern “Laodicean church” age, the laborers are not only few but they are also LAZY! They don’t come out all the time to reap the harvest of souls. It is understandable that there are changing matters in people’s lives but there are people who have not learned yet the needed sense of understanding regarding commitment to ministry. As I have also seen in other places, the laborers may even come out but they don’t always do the work of reaping the harvest. The harvest is not only great but it is perishable. The open door to share the gospel in many places does not always stay open. That door can become sticky to open, difficult to open, or even close and not open again. Many teenage prisoners in the youth detention center were attentive to the gospel of Jesus Christ. I remember a new young prisoner, who I was speaking with, asking me what time it was. Like this kid really needed to know? So I said to him the time then asked him, “Is there somewhere you have to go?” That reply turned his head in awareness since there was nowhere for him to go. Talk about a captive audience! The head of the team was a man named Alvin who was experienced in prison ministry and also trained others doing this. 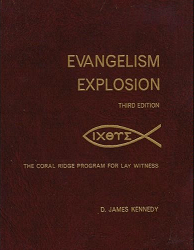 Later we heard that we were going to be given training in Dr. D. James Kennedy’s program called “Evangelism Explosion”. I went through this program before. Actually twice. It was a very specific guideline which we would be expected to follow when sharing the good news. It was not a guideline that I, myself, would go by. So when I heard that this prison ministry team would have to go through this, I said, “OH NO! Not again! Not the gospel in a can!” I was fortunate that I was heard on this and that we did NOT have to do this after all. I remember a time when newcomers were joining our team. One Christian guy joining the team was named “Simon”. I did not have a problem with him but since the name of team leader was Alvin this did give me an apprehension. My name is Theodore and I was concerned that the prisoners would call us “The Chipmunks”. Since, Simon did not actually join with us, I didn’t need to ask him to use a different name. One time a teenager from my own church at the time was accused falsely of a crime which he truly did not commit. He was actually incarcerated at the Newark Youth Detention Center. At that time of his incarceration there were only blacks there as prisoners and he was the only white which gave a possible reason for a deeper concern for him. I know how hard it is to be isolated as a minority. In any kind of minority. I did not know how the others would treat him. I was there for ministry during his incarceration and prayed with him. He was soon released, praise be to God in Jesus’ name! Take advantage of what time and opportunities you have to share the good news of the free gift of eternal life and forgiveness of all sins through trusting faith in Jesus Christ. Show others the proof of Christianity, namely, the resurrection of Jesus Christ from the dead. Please tell people that Jesus has the power to change their lives.